Please help to finish the code. 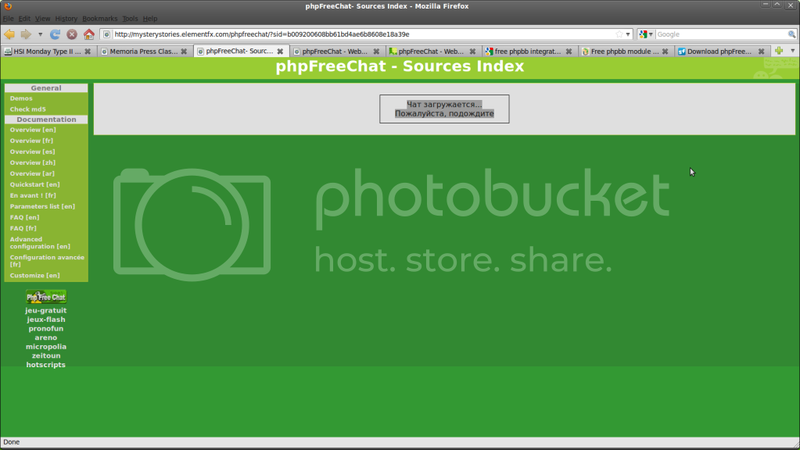 I have phpfreechat-1.0, and phpBB3 forum. So I wanted to make the chat available for the registered users (while unregistered ones could probably have access as guests). The problem is that chat main page redirects to the phpbb3 login page, and when I am logged in, the chat page redirects me to the phpbb3 index (because it can no longer redirect a logged in user to a login page?). I would like to arrange redirection both to phpBB3 login page and back to the chat. One thing missing is that there is no admin identification, and no redirect from login page to chat. These are minor things. Notice that the user time zone according to phpbb3 is referenced to chat messages. Thanks guys for nice work. I really like the phpfreechat software. This will set the correct hidden variable in the login form to redirect you wherever you want after you log in. Last edited by phreadom on Sat Apr 05, 2008 11:46 pm, edited 1 time in total. I have a similar problem. When I click the link to go into my chat room, it logs me out for some reason. If I click 'automatically log me in' it redirects me to the index page. I won't lie though, I'm no programmer. ** EDIT ** Reinstalling the chat software as a subfolder of the forum software solved the problem. Last edited by infojunky on Tue Apr 08, 2008 3:32 am, edited 1 time in total. I hate having to hijack someone elses thread, but I thought it would be a waste to start a new one. The error pretty clearly spells out the problem. You're trying to include a file which doesn't exist at the place your looking. Normally in php coding, to fix this problem you would edit the include path. However, since phpbb uses a variable for the root path, you need to change that (or anything else included from this page will also be completely botched up. What you did, while no doubt trying to rename it to the correct folder (which is good) was lost the very important ".." in the begining of the path (which is bad). Those dots tell php "don't look in this folder, look one level up". With you current code, php is searching the phpfreechat folder for a folder called "phpbb3"... which isn't in the phpfreechat folder... so the file can't be found either and it throws an error at you. Assuming that you phpbb folder name is "phpBB3". That didn't work for some reason, so instead I put my Document Root url in its place and now it works! I also try to use this script within my phpbb forum, problem i have is after loggin in it is redirected to the root of my site. How can i change the redirect so that is redirects to the right path? Last edited by demian on Tue Feb 17, 2009 8:27 am, edited 1 time in total. include($phpbb_root_path . 'common.php'); // include the common.php file, this is important, especially for database connects. That just wont work. You can't pass sessions between different hosts, it doesn't work that way. wow im so dumb, just dawned on me it is set to language RUSSIAN instead of ENGLISH ahhahahha. Last edited by kyl10 on Wed Dec 16, 2009 6:55 pm, edited 1 time in total. No. Sessions are unique to each server. They're stored on the server side and identified by a cookie on the user's end. phpbb_root_path is wrong. You're in the 'chat' subdirectory when this php is interpreted, so the root of your phpbb is "../" not "./" by the looks of it.